They’ve had months to get ready, but it’s such an enormous logistical challenge not everything will be ready on day one. And it’s understandable, with the largest ever timetable change, with trains and crew running new routes. Not everything will be where it needs to be on Monday morning. So to help you navigate what’s not going to be there we’ve compiled the list of Thameslink trains below that will be missing. Note ALL trains running to London Bridge will be ‘Thameslink’. 06:00 & 06:30 From London Bridge. For the former from Merstham you will need to catch 06:11 Reigate (instead of 06:32 – much earlier) and Change at Redhill where a bus will leave at 6:25 and another bus will leave at 06:55 calling all stations to Gatwick. This is for first day only to get stock in right place from Day 2 these trains will run as normal. Some Horsham to Peterborough and back trains will not run. The above may change and we hope that they’re able to start running them soon. As always the planners will be up to date with which trains will and won’t be present. You can check this in your favourite app, at the Southern or Thameslink website, or via realtimetrains.co.uk. In 2015 when cutting over half their London Bridge services Redhill commuters were promised, by no less than the “Passenger Service Director” of GTR Southern, that in May 2018 there would be a significant improvements to their services. This was a false promise, a complete lie to placate very angry commuters. Well those commuters again are very angry, in May their Victoria service will take 11 minutes each way longer, that’s 22 minutes every day longer commute, that’s almost 2 hour longer commuting a week, or 3 and half days a year more on the train. An absolute nightmare for the 4 to 5,000 commuters who rely on these Victoria trains every day. 2,215 signed a petition calling on the DfT and GTR to reinstate the fast Victoria services, Charles Horton of GTR could not even be bothered to reply. The Ministers at the DfT both said it’s tough luck and undemocratically ignored the thousands of commuters from Redhill. The DfT did say that the London Bridge services are better than the post cut service, true when you take out most of the trains as they did in 2015 and then reinstate some of them it will be better than the cut state. Reality is that between 6:30 and 8:00 there was 11 trains to London Bridge or Blackfriars in 2012 and in the new timetable there is just 9. That is not an improvement. They will also be the new Thameslink trains with Ironing board seats. So the new trains are less comfortable, less useful for working on due to lack of space around the seats, and more there will be less seats – the new trains drop from 754 seats in the old ones to just 666 in the new ones. Seats given away on services routinely full and timetables to take either 30 or 40 minutes to London. DFT also said the journey time to London Bridge is faster to compensate for the Victoria trains going slower. Two very clear points from this, passengers for Victoria have no interest in a train service to London Bridge – its half way across town and if your commute is to Victoria, it is because you want to go to Victoria not London Bridge. Second when we used to have peak services to London Bridge in 2012 that took 25 or 27 minutes from Redhill, how can that be slower that the new services that take 30 minutes. More lies pedalled out. The local passengers at Redhill want their Victoria service reinstated at 28 minutes to Victoria every half hour as it has been since the 1970’s. This artile has been written because of the huge number of people realising that their daily lives are going to be heavily disrupted by the huge changes in services along the Redhill route. Arun Valley trains no longer call to save 5 minutes for their other passengers but the higher volume of passengers from Redhill are given 11 minutes extra to sit in trains. This will have an economic impact on Redhill as well, when local firms are already struggling to attract the right staff from London and Brighton. 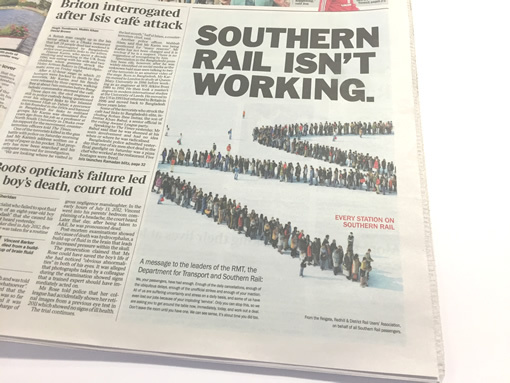 Yet we keep seeing publicity about transforming rail services and “It’s time for a new generation of Rail Travel” plus “tube like” timetables – well we are not getting that. Were getting less and slower trains. We would first like to take this opportunity to thank GTR for their time and effort in consulting upon this major timetable change. Although we feel it is still short of what we would like to see for our Rail Users, thanks to the consultative approach it is far better than the initial proposals to our rail users benefit and thus GTR’s consultative approach has been appreciated. The Redhill line generates around 10,000 journeys a day and this is around 10% of the total journeys from the Brighton Main Line (which when you consider Gatwick and Brighton – two major centres – are on the route this is a very large portion of other journeys). The loss of fast services from Redhill to Victoria will be keenly felt and they will affect several thousand daily passengers. We are also concerned about capacity to Victoria having previously been 3 trains per hour in the high peak hour to just two now. This is the most difficult to accept in the general reduction of services at Redhill compared to the 2012 timetable (which is the last stable timetable to compare to). We still strongly feel that this half hourly all day fast service from Redhill to Victoria should be reinstated as a matter of urgency. Additional late night shuttle service to/from Reigate to connect off the 23:36 from Victoria at 00:20 and last Tonbridge service delayed to also connect with this train. This best done on a station by station basis and then conclusions at the end. Obviously if our proposal for overnight services is accepted and implemented this section would change drastically but the thoughts below assume this is not the case. 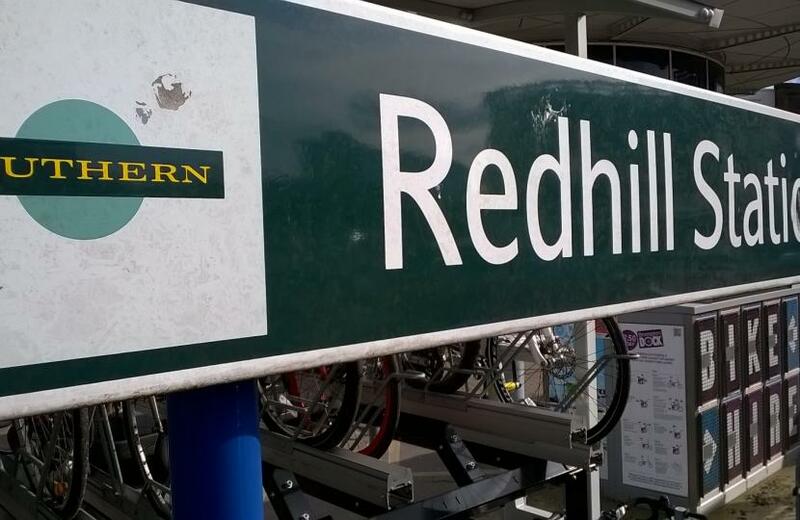 Redhill is the core of the service along our route and what affects Redhill will also affect much else. We are pleased to see the reinstatement of last train from Victoria at 00:08. We would like to see two minor changes to the Victoria proposals. Blackfriars is a very odd situation with late night services some nights but not others. There is likely to be a change in pattern for our rail users returning from some of London late night, especially when Crossrail opens connecting both the West End and Stratford/East London to Thameslink. This will move some passengers away from the Victoria services and onto Thameslink services. As this is encouraged during the day we believe there should be regular services into the late evening for returning passengers. Thus, we would like to see regular trains up until after Midnight from Thameslink to the Redhill route to provide the continuity from the all-day services, especially with Farringdon becoming a major interchange. Up to the point of that train, direct services to Redhill should have not more than a half hour gap. The hour plus gap on Sat/Sun nights is too long. Half hourly until the 00:31 would be ideal every night. Monday to Saturday, these are all too early. We appreciate that it may not be possible to run direct services after these times but would ask whether the last Reigate train could operate a later shuttle to connect with the 23:36 from Victoria to Horsham at Redhill (although we’d prefer this to operate from Victoria at 23:39). We also don’t have late night GWR services which could provide this late connection. Currently however their last train operates from Redhill at 23:34 which would be too early to provide such a connection. There are however several later trains from Reading stopping at Reigate. Last train on weekdays from Redhill is the 23:59 all stations which connects with 23:09 from Victoria and 23:14 from Blackfriars. On Saturday oddly, this departs 4 minutes earlier at 23:55 and doesn’t call at all stations. We would like to see the same last service on a Saturday as the rest of the week. On Sunday the last train is 23:07 which seems to early and we would like to see a similar 23:59 service. For all of these services we would like to see them put back until 00:25 to connect off the 23:36 from Victoria making a much better connection from London events than the 23:55 does. Every day the last calling train is the 00:08 from Victoria – this seems appropriate and provides a suitable level of service from this station. The last calling train most nights is the 23:14 Blackfriars & 23:20 London Bridge service (22:05 from Bedford). We think the 00:08 from Victoria could easily call at these stations as it terminates at Gatwick. However, we appreciate that the train is operated by Southern and would be one of only a few Southern services calling here. If this is a problem, we have also asked for later half hourly services from Farringdon/Blackfriars to Redhill route and some of these could call at these stations. Similar to Earlswood and Salfords although the 00:08 does call. Horley has had overnight trains for many years so we are not sure why the new proposal removes this. However, our overnight proposals would reinstate this service. Sundays seems to be a bit of a temporary measure to get through a period until services can be ramped up some more on Sundays. The regular half hourly service between Bedford and Gatwick provides a good service to Redhill, Earlswood, Salfords and Horley. However, there is an hour gap between the 21:07 from Bedford leaving central London and the first of the services from London Bridge at 23:19. For Coulsdon South and Merstham there is an odd pattern during the day where the Thameslink Peterborough to Horsham and Southern’s Reigate to Victoria trains depart 10 minutes apart at these stations and then there is no train for 50 minutes. This seems to happen because the alternate Cambridge train (to the Peterborough one) runs non-stop from Purley to Redhill. We think this needs to call at Merstham and Coulsdon South – however this will create a tight turn round time at Gatwick but something needs to be done to stop this very poor services at these two stations. We are delighted to see Reigate get a Sunday service even if only hourly and hope in time this can be half-hourly like the rest of the week. We are concerned by last train times both at Reigate and Tonbridge and have covered this above. We are naturally disappointed to be losing our Direct service to Brighton on Sundays. However this has been offset weekdays by good connections at Gatwick. This does not seem to be the case on Sundays but as we can’t see the GWR services this may be an error. Journey times to Brighton should not exceed 50 minutes and we hope this is the case. We have considered the overnight service from Bedford to Three Bridges and would like to see this call at Purley, Coulsdon South, Merstham, Redhill, Earlswood, Salfords and Horley. This has been a long term aim of many rail users along the route and the May 2018 timetable change is a good time to implement this. To achieve this would need an extra train and train crew be utilised on overnight services and would mean a slower journey from Central London to Gatwick Airport. We believe the improvements for staff working and living locally at Gatwick Airport plus the improvements for many rail users locally wanting overnight services from London would more than justify this change in service pattern. We understand that Network Rail will need access to the line for overnight maintenance and hence we have proposed that two nights per week a bus service regularly replaces the overnight trains between Purley and Horley to enable this maintenance to take place. This will provide passengers with certainty through the week. Stations along the Redhill route do not have any overnight service from London, but London is both an entertainment and employment centre for the residents of East Surrey. When working late nights in London it is often hard to get home and often last trains leave before events finish. Gatwick Airport is a major employer in the Surrey region and staff often have to make their way to the airport for shifts that start at 4am or finish at 2am. It would be appropriate to have a service through the night between Redhill route and the Airport. Currently there is a bus service (100) to part of the area from Gatwick but nothing at all from London to the Redhill Area. There is proposed from May 2018 that there will be an overnight service from Bedford, through central London and East Croydon and then fast to Gatwick Airport running every 30 minutes. Our proposal is that it simply stops at Purley, Coulsdon South, Merstham, Redhill, Earlswood, Salfords and Horley on its way to/from Gatwick Airport. We estimate this will add 14 minutes each way to the journey time. 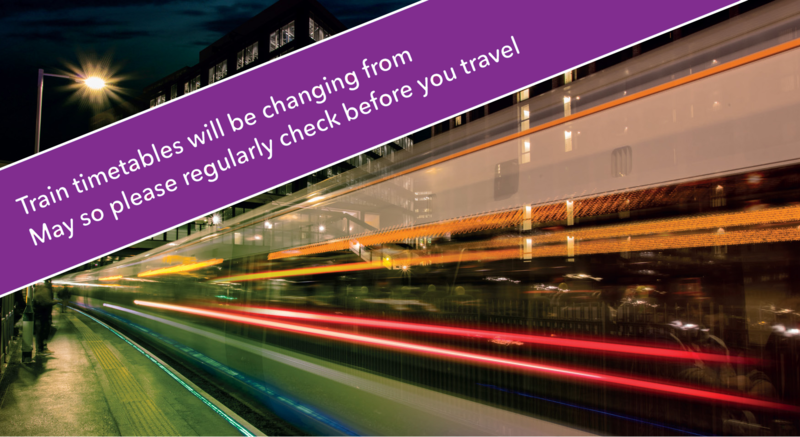 Journeys made available between Redhill route stations and the airport will benefit both the employees at the airport who know they can always get a train to work and the customers of the airport can get there for early flights or return home by train on late flights. The knowledge that there is a train every 30 minutes makes this a good choice for passengers when a train is delayed. Journeys made from London to Redhill route stations will run through the night and will not only benefit residents of the area that there will be an all-night service when enjoying entertainment in London but also for London workers in the restaurant and entertainment industries as they can be sure of getting home after work. The extra journey time on the proposed services will mean that an additional train set would be required to be used for overnight trains as the timings at Three Bridges change. Similarly, at least one extra driver and on-board manager would be required every night to cover these services. It is unlikely to affect existing passengers to Gatwick, as at that time of night the service existing is more important than the speed of the service. A 15 minute extra journey time is unlikely to cause much inconvenience for airport passengers. It would be expected that CDS/MHM/ERD/SAF & HOR would be unmanned at this time of night but there would anyway be minimal manning at Purley and Redhill all night. As the railway is already there, signalman are operating it and the stock purchased, it is just the extra cost of running a single unit that makes this service possible. Network Rail need to maintain the line between Purley and Earlswood through the Merstham tunnels and need clear working time to do this. So a compromise is needed to provide this time. We expect they could do the maintenance with two nights of 4/5 hours clear every week with regular planned maintenance. It may also mean they can reduce weekend work on the line as well. To do this we propose that the Purley to Redhill/Earlswood section is closed after the 23:09 Victoria to Reigate and 22:05 from Bedford (23:21 LBG) which both connect for last train to Tonbridge. This would be set to happen every Monday and Tuesday night to allow Network Rail regular access and can get the appropriate equipment into the area for two consecutive nights per week. If the line is closed after this then the route will be available to Network Rail for just under 5 hours from midnight to 5am to close the line and work intensely (probably means around 3-4 hours actual work as setting up and clearing takes time). First train in the morning leaves Purley at 05:10 and Redhill at 4:49 although this could be part of the overnight buses. The gap is similar to that left by the Victoria closure so we would expect it would be good for Network Rail to do their work. It would affect GWR services as well. Their current final service from Gatwick passes Redhill around the same time as the Reigate train. The last train from Reading may need truncating some nights depending on the work required at Redhill station itself each night but as GWR trains are diesel they don’t need power and thus some nights may be able to pass by without affecting the works. To replace the trains, a bus service will need to run from Purley. The timings of the bus should leave Purley every 30 minutes to connect with the trains. Each train should get initially a single bus calling all stations to Gatwick and return. We estimate it would take two hours to cycle the buses and thus with a driver’s break probably needs 5 buses to run. Even though the trains can still call at Horley, it is better that the passengers are taken straight to Gatwick to avoid the difficulties of timing the bus to a train – the two services (train and bus) can work independently at the Gatwick end. When Network Rail have access GTR would be able to run the service with one less unit of stock. The Redhill line has over the last 10 years had services cut, journey times extended, regular cancellations and immense overcrowding. We had hopes of an improvement in our services and in fact was promised improvements in 2014 when our peak services were slashed and journeys made longer. Unfortunately, this revised timetable proposes less services again and even more journey times extended. It is unacceptable that it is proposed that it will take only 11 minutes longer to get from Brighton to London Victoria than it will from Redhill. It is unacceptable that it should be proposed that the Redhill line is cut off from the Brighton Main line and no longer has through services to the Coast. It is unacceptable that a town the size of Reigate so close to London does not have a regular service to London every day of the week and that service is such that it usable on a turn up and go basis. We would also like to ensure service levels are retained at Merstham and Nutfield, as well as keeping Victoria trains at Earlswood, Salfords and Horley. 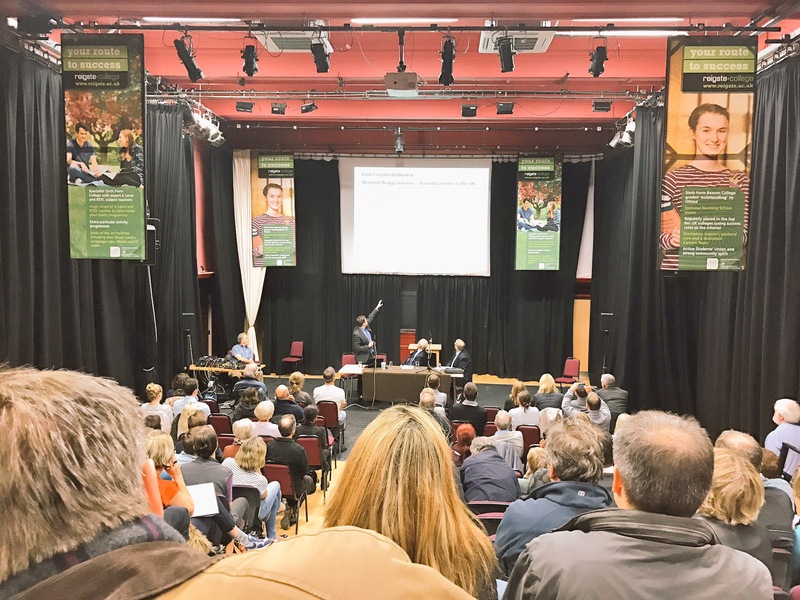 We would draw your minds back to the Public meetings held over the severe cuts to the Redhill route services in 2014, where it was promised in return for accepting the cuts we would be guaranteed an improvement against the then current services. This proposal with slower trains and significant destinations removed from the direct services is not an improvement. GOVIA owned the Franchise in 2014 and do so today and they should stick to their promises. It is not time for a future promise this opportunity to rewrite the whole timetable should be used to ensure that the Redhill Line finally gets the jam tomorrow it has been promised for years. 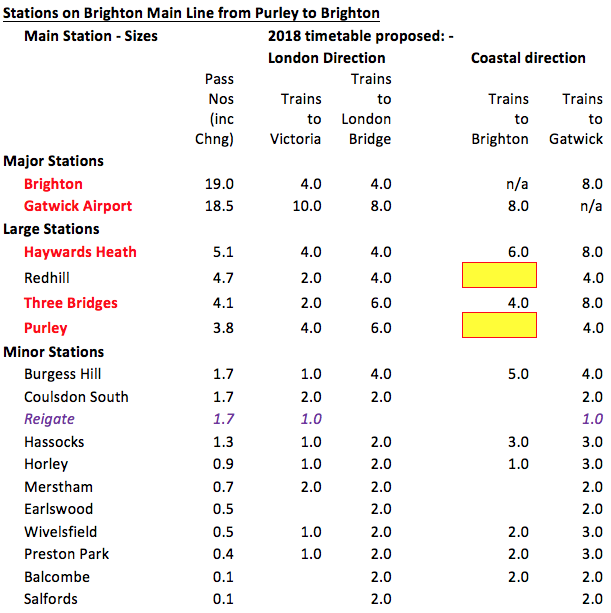 Redhill Line generates a significant percentage of journeys South of Purley on the Brighton Main line (our estimates are between 17-20%) but will only receive 12% of services that leave Victoria which is not enough for passenger loads. The middle group of stations are the key stations along the line and it is immediately obvious that Redhill is underserved compared to similar stations. To London, Haywards Heath and Three Bridges have 8 trains per hour and Purley 10 compared to just 6 from Redhill, but also despite being on the Brighton Main line, no through services to Brighton are proposed in the 2018 timetable. This poor service is also applied to Reigate, which although not directly on the Brighton Main line has been included in the table for comparison. The one train per hour to London does not run evenings or Sunday meaning unlike most others listed here so the service to Reigate is even poorer than it appears. Currently many services from the Redhill line are beyond capacity and leaving passengers at the station is not as uncommon as it should be. The new trains being introduced in 2016 will assist loading on the London Bridge although it is very disappointing that many seats are being replaced by standing space. Capacity will still be a problem especially on the Victoria route. New Housing in Redhill, Salfords and Horley means higher demand for services. Around 1,400 new homes are already planned near Redhill, from which will bring around 40% of them with commuters. This interprets as around 5-600 extra commuters daily at Redhill. This is already overshadowed by another planning proposal for 4,500 homes locally and additional houses in the local plan. At Meath Green near Salfords building has already started on 600 plus new homes with opportunities for more to be added. Capacity is thus a significant issue and suggest that Redhill will need 8 trains per hour as a base service by 2018 or shortly thereafter, thus this timetable is the correct time to put that facility firmly in place. The Redhill line is also a destination for commuters and school traffic (especially at Reigate for the college based there) and the lack of consistent service (regular all day service) from the South in recent years since Brighton trains were removed, have meant that local businesses have struggled to find employees and the local commuter base suffers in that the entire commuter service is biased towards London plus travelling off-peak journeys can involve two changes. Even including the arrival of Crossrail, the London Bridge/Thameslink route is not a viable alternative for London Victoria passengers. London is so large these are very much different destinations and depending on required destination in London, passengers will select the most appropriate terminal. The fact that on average it is a 50/50 split between each at most stations means the requirement should be for a 50/50 split in train service. The proposal to extend normal Journey time from Redhill to Victoria by over 40% is not acceptable. Redhill has been less than 30 minutes to Victoria since whenever most of us can recall. The reliability of two trains per hour to Victoria taking less than 30 minutes is an accepted fact for Redhill passengers. To extend these to almost 40 minutes is totally negative. It is not only the 2 million plus Victoria journeys that are affected every year but also those to Clapham Junction for Waterloo, other South West Destinations and to Shepard’s Bush on the London Overground. We thus request that this is returned to main line trains taking 28 minutes from Victoria. The proposal to run shuttles to Reigate is considered by our members consulted to be unacceptable. The key reason is the unreliability of the Shuttles previously provided, often in the evening the entire shuttles go missing if a driver is ill or delayed. Same goes for complete loss of peak morning services leaving passengers scrambling around for buses or other to get to Redhill. We agree with GTR’s statements in public meetings that the best answer is Platform 3 at Reigate and then the Bedford to Gatwick services becomes a Bedford to Reigate service running 7 days per week. This would provide a half-hourly service to Reigate from London stopping at Merstham, Coulsdon South and Purley for school traffic. However, the current situation is that platform 3 is not programmed yet by Network Rail so we must look to alternatives. Reigate is a station where there is significant latent usage due to the unreliability and lack of direct trains during much of the day, many passengers drive to Redhill or Merstham to catch the more regular direct service and avoid getting trapped at Redhill station when returning from London. Redhill has a shortage of car parking spaces with a waiting list often over a year long and Merstham has parking problems around the town caused by commuters parking. Reigate also has a growing business community including a major Insurer plus a major college where students come and go throughout the day. We have surveyed our community and from almost 200 responses we discovered that around 50% of Reigate residents travel to Redhill or Merstham for train services. Around 65% would walk to Reigate if a regular train service was provided. This means passenger numbers will double very quickly if the regular service all day is introduced. We thus propose that this can be achieved by using splitting of trains from Victoria at Redhill station. Once at Redhill the half hourly Victoria service should split, in each Half hour the front portion should go to Reigate providing a half hourly service to Reigate from London. In the first half hour, the rear portion should extend to Tonbridge maintaining the existing service, in the second half hour the rear portion should extend to Gatwick, calling at Earlswood, Salfords and Horley providing a new hourly fast service from these stations to Victoria all day every day. This pattern would benefit not only Reigate with a Half hourly London Service but also mean that Earlswood and Salfords are reconnected with Victoria in off peak times which was lost in 2014 for evening services and 2008 for day time services. This services pattern should repeat from Monday to Saturday all day from start of service to late evening (last service not before midnight) and on Sundays either continue or become hourly as a Victoria to Reigate/Tonbridge service. The calling pattern from Redhill to London is dependent on the ability to route a Brighton service via Redhill. We believe this can be done and thus this Reigate to Victoria could act as a local service between East Croydon and Redhill. An additional advantage of this proposal will guarantee 8 coaches at all times from Redhill to Victoria which will be a big improvement from East Croydon to Victoria than the current four coach services. In 2008 there was a half-hourly train service between Brighton and Redhill which went onwards via London Bridge to Bedford – a regular Thameslink service. This was swapped out in a reorganisation of the Brighton Main line but the Redhill route received trains from the Arun Valley instead. In 2016 these were diverted to go fast along the Quarry line meaning a 5-minute reduction in journey time for Arun Valley customers to Victoria. However, the far more numerous Redhill Line customers now face an 11-minute increase in journey time to Victoria. Currently on Sunday there is an hourly service to Brighton all day (alternating with a Bognor service) but both will be removed by the proposed 2018 timetable meaning the last regular service from Redhill to the coast is withdrawn. Why does Redhill need a service to/from Brighton? With planning restrictions on car parking spaces at offices being enforced businesses are increasingly looking to get people to come to work by train. Not having direct services will make Redhill and Reigate less attractive to businesses and to commuters. More than this it means more cars on the roads as the idea of commuting either way by train is not straightforward forcing this commuting traffic onto our crowded local roads. Additionally, there is a strong leisure traffic both to Brighton and local business in Redhill are trying to attract from the line. This traffic as well is significantly put off by changing at Gatwick Station. Gatwick is a nightmare station to change at and the new proposals are solely aimed at Airport traffic meaning it will remain so. Currently Brighton is proposed to be served by 8 trains per hour from London, 4 from Victoria and 4 from Thameslink. Two of the trains from Victoria are express trains taking less than an hour, operated by Gatwick Express and the other two are also relatively fast trains stopping at only 4 stations on the rout to Brighton, two of those in London itself. We believe the second set of fast trains from London is unnecessary and could be diverted via Redhill to provide a better service. Also by rejigging the stops you could make one of the Thameslink trains faster meaning London Bridge and Thameslink can be got to faster from Brighton. The proposal to remove all Victoria trains from Earlswood and Salfords is not acceptable. We want GTR to ensure that there is a Victoria service in the Peak and preferably for most of the day. Our proposal for the Reigate service does do this by providing an Earlswood/Salfords to Victoria service all day. We have looked at the Brighton Main line services heading south from Purley (we have excluded Milton Keynes and Southern Metro Stopping Services. When looking at this in terms of a Brighton services from London there are 8 per hour. The services from Victoria are Gatwick expresses which only stop at Gatwick and a fast service calling at CLJ, ECR, GTW and one other station. However the Thameslink services whilst only stopping at ECR before Gatwick then take either 4 or 5 stops before Brighton, meaning services from Brighton to Thameslink are much slower. RRDRUA suggest a calling pattern that still allows a fast service from Victoria to Brighton which is the Gatwick Express, but the second service calls additionally at Redhill, Three Bridges (for Crawley) and Burgess Hill, which would take between 9 and 11 minutes longer than currently. However, 2 of the 4 Thameslink services could lose stops at Three Bridges saving 3 minutes on journey time to Brighton. Haywards Heath could be swapped for Three Bridges. This proposal also shows changes to the stopping pattern of Thameslink Slows, so that one of the half hourly trains calls at all stations and the second is fast. We think this would provide a better balance and mean the Horsham longer distance service saves considerable time on its journey into London making it more attractive. We have also shown our proposal for the Victoria to Reigate half hourly services with extensions to Gatwick and Tonbridge alternate half hours. Lastly a less preferred option of a fast service from Reigate (with half hourly splits to Tonbridge and Gatwick) without the extra Brighton service that we would like to see instigated. The Thameslink services would fill the gaps with both half-hourly services calling at Merstham, Coulsdon South and Purley as they do now but with the extension of journey times. This is better than the Victoria service calling at these stations as it means the more regular service picks up the extra stops but there is less waiting at the London Stations for the service to make journey times even. There are two major planks to our preferred solutions. As there is a fast service provided from London Victoria to Brighton by Gatwick Express that is not a premium service, the second train each half hour from Victoria provided by Southern should call at more stations including Redhill. Reigate needs two trains per hour to London all day every day and not connecting shuttles or GWR services, this is best provided by splitting the trains every half hour at Redhill, with one half hour maintaining the existing Tonbridge service and the second creating an additional stopping services between Redhill and Gatwick. We have also included a response to each of the questions in the survey. RRDRUA and all the passengers at Redhill Line stations urge GTR to honour its promises to them when devastating our local services for the London Bridge works and provide an improved service against the 2012 baseline including reinstating services to Brighton. 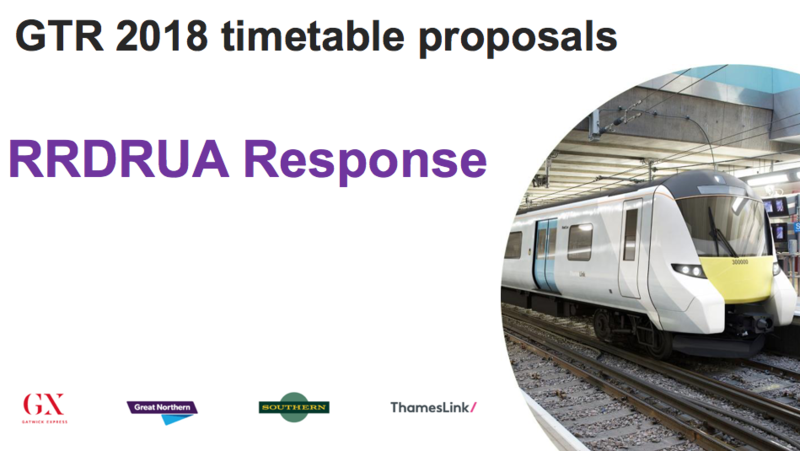 In association with Surrey County Council and Reigate and Banstead Council we’ve arranged for Govia Thameslink Railway to come and present their proposals for the 2018 Southern and Thameslink Timetable. 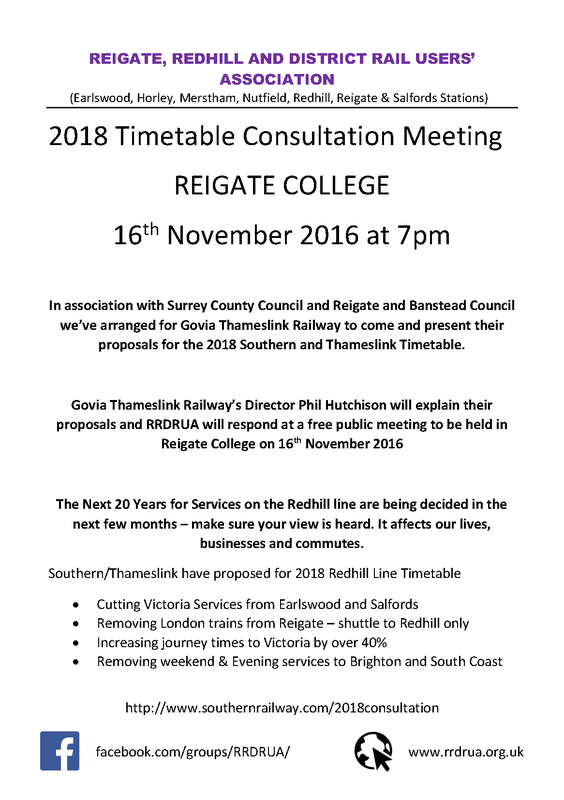 The Next 20 Years for Services on the Redhill line are being decided in the next few months – make sure your view is heard. It affects our lives, businesses and commutes. We, your passengers, have had enough. Enough of the daily cancellations, enough of the ubiquitous delays, enough of the unofficial strikes and enough of your inaction. All of us are suffering uncertainty and stress on a daily basis, and some of us have even lost our jobs because of your imploding ‘service’. Only you can stop this, so we are asking you to get around the table now, immediately, today, and work out a deal. Don’t leave the room until you have one. We can see sense, it’s about time you did too. 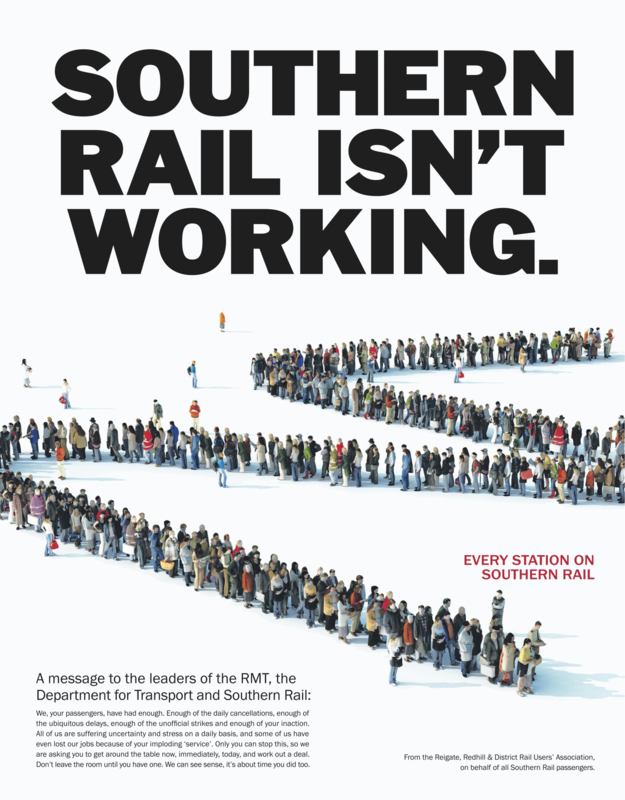 From the Reigate, Redhill & District Rail Users’ Association, on behalf of all Southern Rail passengers. As featured in the Times newspaper on 6 July 2016. I’ve been contacted by Sky News who are interested in covering our struggles of how to get to work this coming Tuesday when the strike is on. They have stressed that, whilst they are keen to feature something other than the EU referendum, they obviously don’t know what the news agenda will be that morning, so our featuring is NOT guaranteed (as with any news feature). But they would like to speak to people who will have no choice but to travel to work on Tuesday, who need to get the train and have a personal story to tell, such as whether this has affected your job, your health, home life etc. They’re not looking for aimless rants, if that makes sense! If you would be happy to take part based on the details above, please can you message me on here with your details and a small bit of background, as well as specifying that it’s Sky News you want to help with? A producer at Panorama has contacted me about helping with a programme they’re making about the railways in the UK. They’re in early stages of development at the mo, and are trying to research what their angle will be. I have explained our situation and background and they’re keen to involve us and our situation. They’d like to speak to people who have a story to tell – work issues/childcare problems/moving house/health problems directly resulting from train troubles. They’d also like to use footage from particularly bad services/situations on trains or at stations if people would be happy to film and share with them. However for this to be usable it MUST be filmed in LANDSCAPE rather than PORTRAIT on your phone. If you would be interested in speaking to the producer then please message me on here with your details, background and that its Panorama you’re interested in etc and we’ll go from there. Let’s show the DfT and relevant ministers/sec of state that we won’t take this anymore and get involved. I’m acting as Single point of contact so they aren’t overwhelmed. Thanks all – let’s put some pressure on the government and DfT!